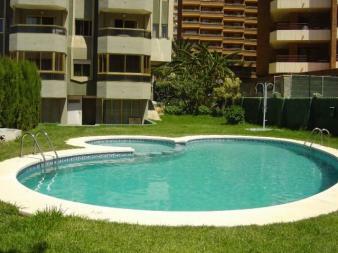 These apartments are situated in an excellent location, just 250 metres from the Levante Beach. Surrounded by bars, cafes, shops and restaurants and with a bus stop just a short stroll away. The building has 16 floors, two lifts. All apartments have a twin bedroom and sofa bed in the living area for a 3rd and 4th person. The apartments for 5 people have an enclosed terrace with a single bed. All include a fully equipped kitchen, bathroom, terrace and utility room with washing machine. Safety deposit boxes and cots are available to rent. 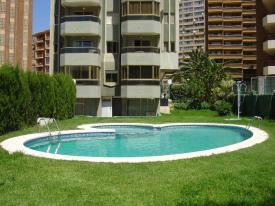 Surrounded by a lawn with showers, the swimming pool for adults and children can be used throughout the summer months. There is also a free car park (subject to availability) Price includes: Full cleaning on departure, weekly change of linen (sheets and towels) and an extra change of towels during the week, electricity, water and maintenance. When collecting the apartment keys, guests will be required to pay 200 Euros deposit which will be refunded at the end of their stay once the property has been checked that there is no damage or missing items.